One hour long you-tube documentary from Sonia Poulton up this evening. Have just finished watching Sonia Poulton's latest film. 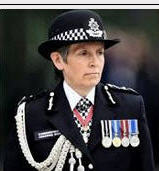 Hats off to her. I was very, very impressed. Hope it is widely watched and shared. Nothing new again. It's all in the public domain already and been said and done before. I still think Richard D. Hall's films are more informative. Just watched it though for first time. Certainly nothing new and could probably be picky about some bits, but an ideal 'get something out there' programme, suited to Channel 4, who presumably refused to take it up, which is a shame. Yes, Richard D Hall's films go deeper, but she does advertise them in the programme and they are probably not 'polished' enough for mainstream TV viewing, which this is. At least she refrained from editing the CMOMM forum header to add the word 'cesspit', which is what she and her pals usually call it. No no no no no no no - this cannot be. What on earth is poulton/patreon.com hoping to achieve by this compilation of newspaper cuttings, media clips, pretty pictures all generously packed out with moody scenes of Ms Poulton herself - she do like to take centre stage don't she? Admittedly, I haven't managed beyond about forty minutes - does it improve as time rolls on? I was a little dismayed within the first few minutes where she implied that the Daily Telegraph reported the event at 12:01 am on the 4th May 2007. This minor point was thrashed out on CMoMM months ago - the time shown on the Telegraph archive is not the time the report was published - end of! A perfect illustration of how myths are born and propagated for eternity - in the wrong hands a very destructive force. 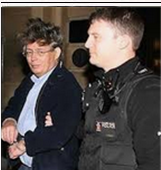 Moving on to the inevitable reference to trolling (including the alleged demise of Brenda Leyland - please let the woman RIP), incidently mingled with screenshots of fora and blogs primarily dedicated to the case of Madeleine McCann's disappearance. Trolling - a subject always close to Ms Poulton's heart and never far from her mind. 10/10 for effort but otherwise same old same old. 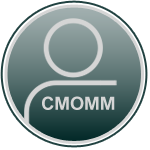 I wonder if she used CMoMM as her primary source of information? Remember folks - you saw it here first! I am not sure that I want to waste time going over old ground so I haven't seen this yet. Is it really worth watching or am I right in suspecting that this is just another attempt at keeping the focus on May 3rd when there is no evidence of anything happening to Madeleine that night, and no evidence against the McCanns? I did watch it , waiting to be informed of something I didn't already know ! @sandancer wrote: I did watch it , waiting to be informed of something I didn't already know ! Well.. maybe it will get new people interested. True there is nothing new, but sometimes dead horses get up and say "ok already... so I wasn't really dead". I love floggin' dead horses. I'm quite willing to patronize a patreon.com project . Was there anything in Sonia's latest film that was new to me - of course not! Yet I welcome it. It reminds me of a long-ago conversation I had with a former psychology lecturer. Way back then, he was holding court about the relative merits of children's "educational" T.V. programs and confidently declared that "Sesame Street" was a poor example of such programs. He justified his claim by stating that it had served his own children quite well in their early years but failed to progress past a certain point, while they had "outgrown" it. He was rather gobsmacked when I, a cheeky undergrad, pointed out that Sesame street was not specifically created for his children and their cohort and that these children had now been replaced by a new group of kiddies who were then at the stage to benefit from it. In time, they too, would be replaced. In other words, "Sesame Street" was what it was - a useful tool for those for whom the knowledge was still a revelation. I don't believe Sonia's film is aimed at those already well versed in the inconsistencies surrounding the Madeleine case, but expect it to be very useful and informative for the very many who have never questioned the McCann and MSM version of events. 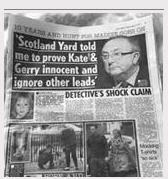 There are many who labour under delusions and untruths thanks to McCann MSM spin and Kate's book. If Sonia's film is seen by any persons who would otherwise rely on Khandola et. al. for information then IMO, YIPPEE!!! The more the truth of the shameful handling of Madeleine's disappearance spreads (and I don't give a fig who spreads it) the better. The main thing for me is that Sonia Poulton has got 13.5K followers on twitter and goodness knows how many more on facebewk, youtube etc. She is also well known in the media. Her film is, therefore, likely to be seen by far more people than those who merely spend their days abusing each other on #McCann. Someone has to help rattle the cages of the Establishment, and she does that. And I think, on the whole, she does that very well. 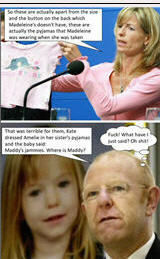 She promised the 'Untold Story of Madeleine McCann' - and she's doing that. And it's good to see Clarence Mitchell throwing a "people like you" hissyfit when confronted by her. 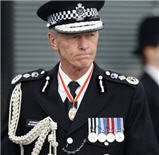 She also told the tragic and extremely shameful story of Brenda Leyland - and maybe that will be seen by some people who didn't know, or weren't really bothered, about what really happened having believed the MSM that she was nothing more than a 'vile troll' who needed to be made an example of by the McCanns, Martin Brunt and Jim Gamble. I certainly hope so! Sonia is spreading the story further and wider than those of us can, and hopefully some new people will watch it, and be shocked by it, and be angry about the difference in what the MSM has been telling them for the past 11 years..and then be tempted to delve further. I can't see that being a problem. I love your story Phoebe about the lecturer and Sesame Street. Did he really expect it to change to a more grown-up format just for his own children! I agree with those who have said that the video is good for those who don't know a lot about the case. @Phoebe wrote: Was there anything in Sonia's latest film that was new to me - of course not! Yet I welcome it. Wonderful post! Thank you so much, Phoebe. You’ve got the words and the gift of being able to use them in such an inimitable way. My hat is off. I feel like tears, truly. Bless you. @Amy Dean wrote: I love your story Phoebe about the lecturer and Sesame Street. No problem with the door, it's Cerberus you need to look out for . Then again, dogs have always been a problem in this case haven't they. Patreon is a USA based workshop that encourages anybody and everybody to make money out of small time ventures in order to showcase and develop projects for a public audience. 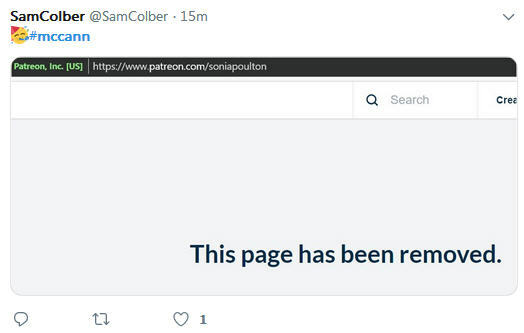 Sonia Poulton's latest venture has been to use patreon for the intended purpose. That's not a criticism, her film production has improved considerably in latter months. However .... her work is still only showcased on YouTube, therefore has little or no potential for reaching a wider audience. Ms Poulton has said herself on numerous occassions that she hasn't been able to secure a mainstream media outlet to promote her work. This may be because of the sensitive nature of the subject or may be because the big guns are simply not interested in small time film producers promoting timeworn stories of bygone days. I really can't see anything useful emanating from this latest film apart from advancing Ms Poulton's skill in the movie making industry - it's all been said and done before. Nor do I believe it will encourage a new generation of case followers - folk have lost interest, the McCanns themselves have turned this into a monotenous circus that's resulted in nothing but boredom and public disdain at the shear waste of public money. The case has, or will, become history. Like so many unsolved crimes of yesteryear, it will be preserved for study as will CMoMM when all others have been forgotten. Let's keep it professional. Thank you for your comment. I appreciate the distant rhyme. It’s interesting you should mention that. One might indeed be well advised to look out for Cerberus. Not me: I love dogs, have no problems with them, and when I see a man with a dog, I trust the dog before I trust the man. This strategy has served me well. However, that doesn’t seem to be the point you want to make. What is your point please? Are you implying that you will keep me in? Am I right in thinking that the yellow round image is a friendly wink? Not always for me, I dare say, or at least not to the extent that ‘the dogs’ have been a problem for many others, including the McCanns.